When we say cookie bar, we mean every aspect of a cookie bar you could want. We come set it up and then our staff mans it throughout the event, so all you have to do is party. We don't do cheap cookies. Each batch is made fresh right before the event and made by professional bakers. We offer just about every flavor you can think of, just let us know your favorites! 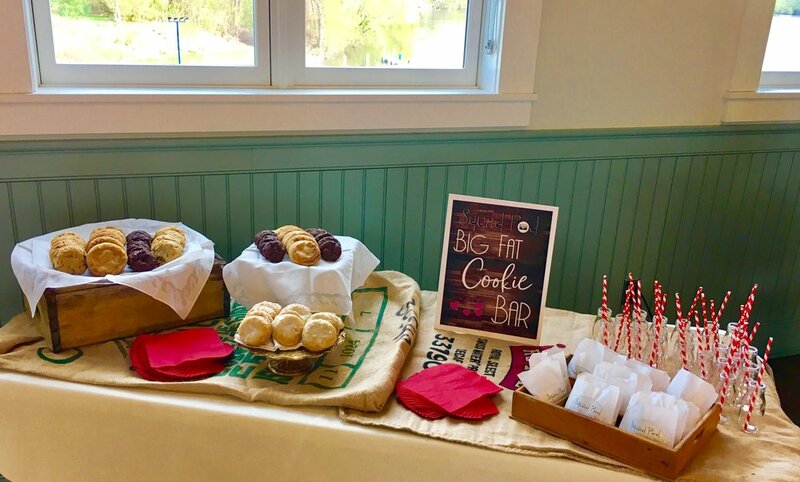 In addition to the delicious pastries, we include milk shots and take-home pouches, for the perfect cookie with each bite, and to continue the sweetness even when everyone goes home. Derby day? Off to Suffolk Downs! We work with each and every client to get the exact look you're looking for in party. Backed by professional photography studio, EB Taylor Photography, we make sure your pictures are top of the line and perfected for your event. No matter your theme, no matter the event, we'll make sure you have precisely the look you want. Backed by professional photography studio, EB Taylor Photography, we customize photo strips for each event. Be it a birthday party, prom, or business event, your name, logo, or brand will be included. Photo strips can be printed, emailed, texted, and shared directly to social media from the photobooth, so sharing is easy!